The Difference Between Cases Involving A Wrongful Death And Negligence. How Medical Malpractice Applies To Childbirth And Issues Arising From Oxygen Deprivation. Parents usually feel very close to the doctors whom they have relied on and trusted. Once they come to see me I can tell them what, in their situation, they may expect in terms of cost of care for an infant that has been damaged. To get good care and to maximize the abilities that infant has, it really does cost some money, and it’s far beyond what the Ontario government provides in terms of care. At that point parents realize what rights they need to exert on behalf of their child. Generally, their particular health plan will just help pay for some of the days off that they will be taking for visits to numerous service groups in the community. It is very frustrating for them if they have to rely solely on those services that are provided to assist their child. It is a very difficult system to work through. Schools are a challenge for parents, too. I have gone to schools and spoken to people from boards, teachers, psychometrists, psychologists and explained the necessity for honesty in evaluating the children. I have found teachers copying children’s notebooks and others providing glowing reports that don’t truly reflect the child’s difficulties. When a child has been intellectually damaged, it is important that false hope and information not be given to the parents. They need to advocate for the best help for their children as they really are and facing their special and difficult challenges. In order to do this, they need all the facts. If they are seeking money for their child based on the child’s abilities, then they could lose that money if the child is reported to be more capable than he or she really is. We know that people are well meaning, but they need to be honest to really help our clients get what they need for their children. Many of these cases take many years to bring to a conclusion and closure. If you, or someone you care about, is dealing with Personal injury law issues in the Toronto, Ontario Region, contact Strype Barristers LLP. 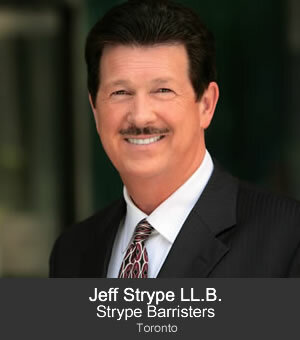 This article is taken from a September 7, 2007 interview with Jeff Strype LL.B., Personal Injury Lawyer with Strype Barristers LLP in Toronto , a Personal Injury Law Firm. Note that laws vary from province to province. Please consult with a lawyer in your own area to be sure of the laws and specific issues in your own jurisdiction.